This past year has been a crazy one: moving away, finding new passions, trying new things, falling down, picking ourselves back up, engagements, wedding planning, moving back, and just generally trying to figure out what works. This has been a year of learning for all of us with the blog, and in life. We are just living, and life always has a lesson to teach. This has been an amazing, eye-opening experience for me. I always knew my sisters were talented, amazing and beautiful women, but reading their thoughts has shown me new bits about each of the sisters. I feel like you can find out a lot about people through their writing, and it holds true to this experience. I mean, in all of our very first posts, there were timid steps as we each set foot into blogging, but we found our way, kept going, and the sisters and the readers all ended up inspiring me more than I had thought humanly possible. This blog has been a new push through everything, and when I re-read all the posts, I realized how much we all changed, or at least I have changed. I realized how much I have been able to still keep pushing through all the negative that can come with change. Change usually scares me, but this time, I’m not scared at all! I’m excited and can’t wait for the next blogging year for our sisterhood! And now, without further ado, my giveaway is hand-crafted jewelry and a survivalist bracelet made from parachute cord made by my friend Kate, and a tea wallet so you can have that fresh tea anywhere made by Kate’s awesome Mama! 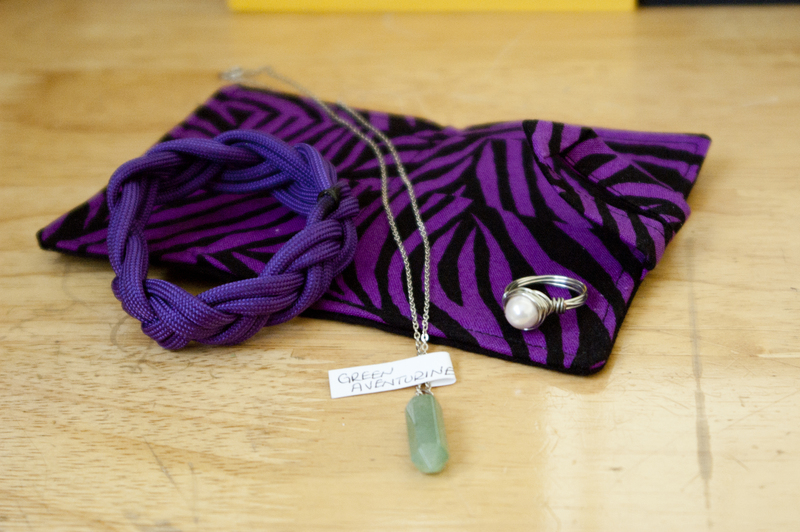 Survivalist bracelet, beautiful hand-crafted ring and necklace, and a tea wallet! I want to thank you, dear readers. You have been a wonderful and captive audience, and we owe you lots of hugs for the past year! And my question I pose to you is: What is the one accessory that you’d feel naked without?